There is definitely more to South Korea than only Seoul. 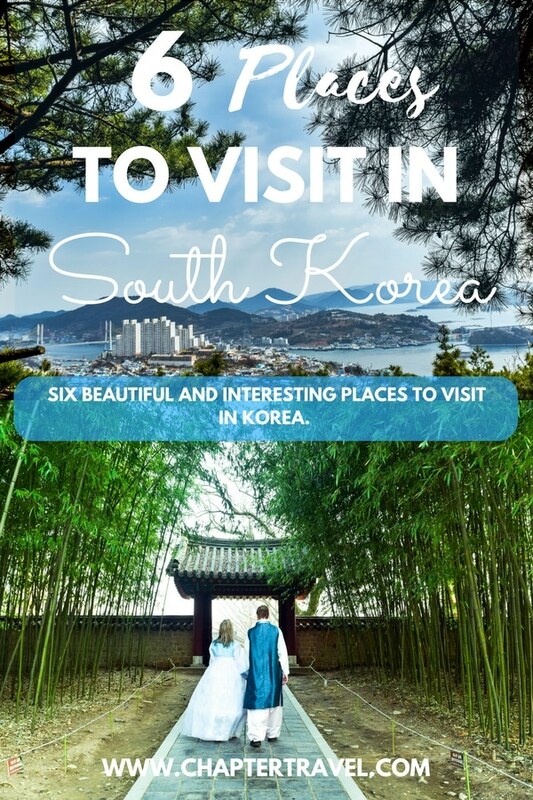 Therefore, in this post we list 5 other beautiful places to visit in Korea, alongside the capital of South Korea. During our visit to South Korea, we were lucky that we had a local friend from Seoul who showed us his amazing country. He knew the best places to go in Korea and travelled with us. Because of him, we went to places in Korea most tourists skip. For instance, the southern region of South Korea is often overlooked! We went to Korea in the Springtime, so we could enjoy the cherry blossom season. 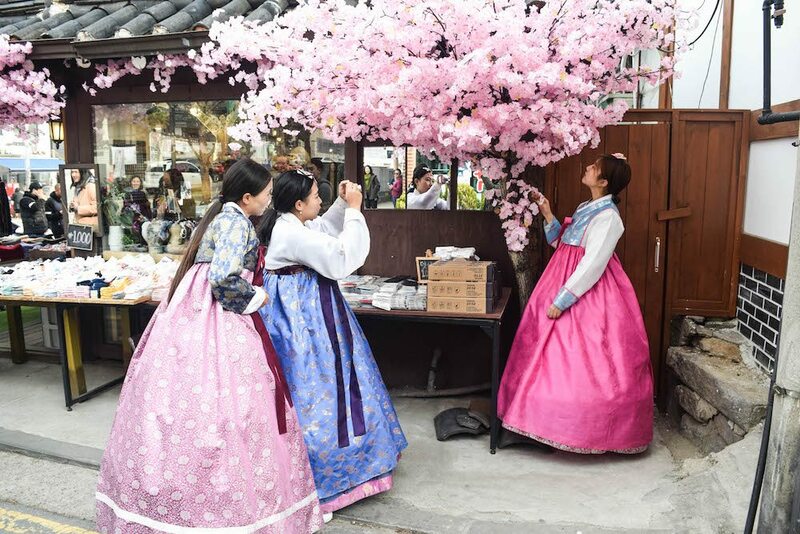 But even outside of the cherry blossom season, South Korea is a wonderful country to visit. There are lots of fun activities and beautiful, historic places to explore. Below we share 6 beautiful and interesting places to visit in Korea and also share some accommodation and tours. Of course, you can’t skip Seoul during a visit in South Korea! It’s one of the largest cities in the world, with impressive skyscrapers, modern architecture and lots of modern shops, restaurants and cafes. We absolutely loved the vibe of Seoul and even felt like we would be able to live there. During our travels of 1.5 years we didn’t say this about any other location. It must’ve been the fact that Seoul is perfect for expats (modern and comfortable), yet still offers a different, interesting culture and lots of history. In our travel guide to Seoul you can find lots of fun activities in this cool city. But it also includes practical information for your visit to Seoul, such as how to travel around, how to use the T-Money Card and more. Where to stay in Seoul: L7 Hotels Myeongdong. Jeju Island is located on the coast of South Korea. Not only is it the largest island of the country, it’s also home to the highest mountain in Korea: Mount Hallasan. Jeju Island is a popular destination for Korean newlyweds and it’s even nicknamed ‘The Hawaii of Korea’. The highlights of our visit to Jeju Island were definitely Mount Hallasan and Seongsan Ilchulbong Peak (pictured above), but there are more places to go on Jeju Island. 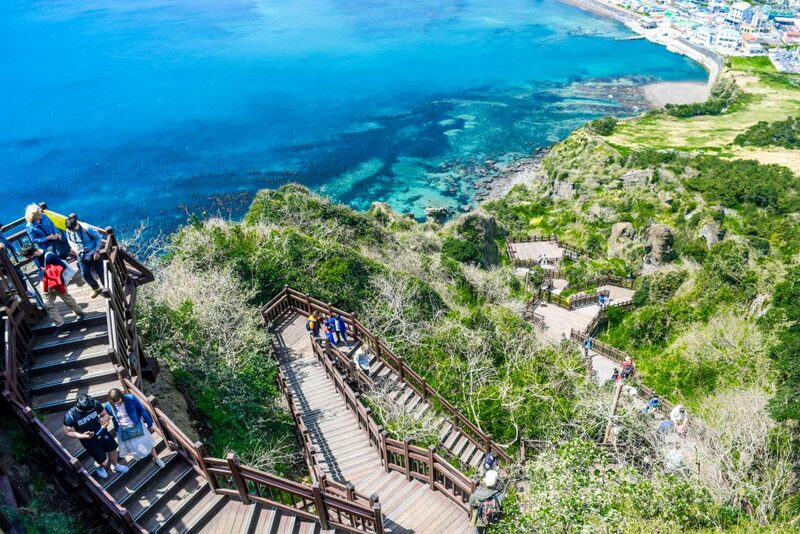 Read our guide to Jeju Island for a lot of fun activities on this little piece of paradise. The article also contains practical information for your visit, such as the best time to visit Jeju Island, how to get around the island and more! Where to stay on Jeju Island: Hotel RegentMarine The Blue. Suncheon is a beautiful place in South Korea and it’s emerging as the ecological capital of the country. 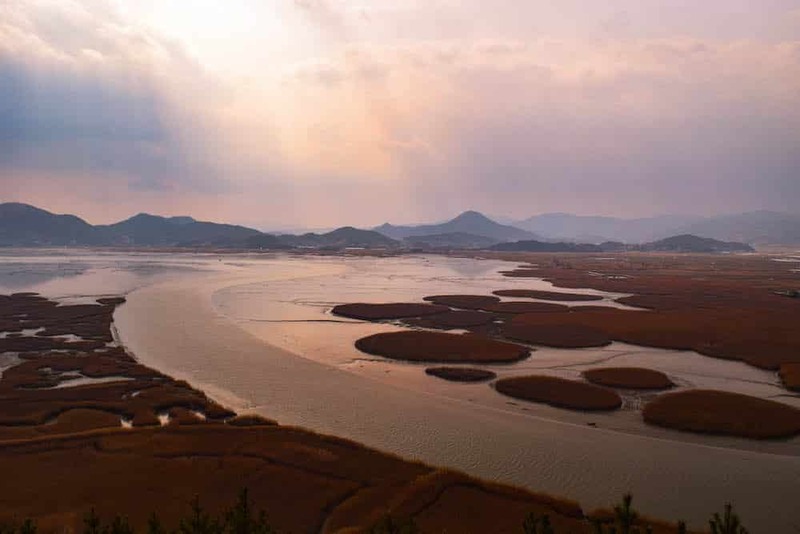 One of the reasons is the Suncheonman Bay Wetland Reserve which has remained almost untouched. Just to visit the wetland reserve, we recommend you to take a day or two. There is more to explore in Suncheon, such as the Naganeupseong Folk Village and the Suncheon Bay National Garden (which is pictured as the highlighted photo above). In our article about Suncheon, you can read more about the Suncheon Bay National Garden and Suncheon Bay Wetland Reserve. Where to stay in Suncheon: CF Motel or The Suncheon Piano Motel. If you know that Yeosu means “good water”, you won’t be surprised to hear it’s a maritime city. There are 317 islands in Yeosu. In Yeosu you can use the Yeosu Maritime Cable Car to have a fantastic view in a cabin with a see-through glass bottum. Another fun attraction is the Yeosu Ocean Railbike, which is a trail that takes you along the coastline of Yeosu. We weren’t as impressed with Yeosu as we were with Suncheon, and you definitely need less time to explore this city. Both places are also easily combined! 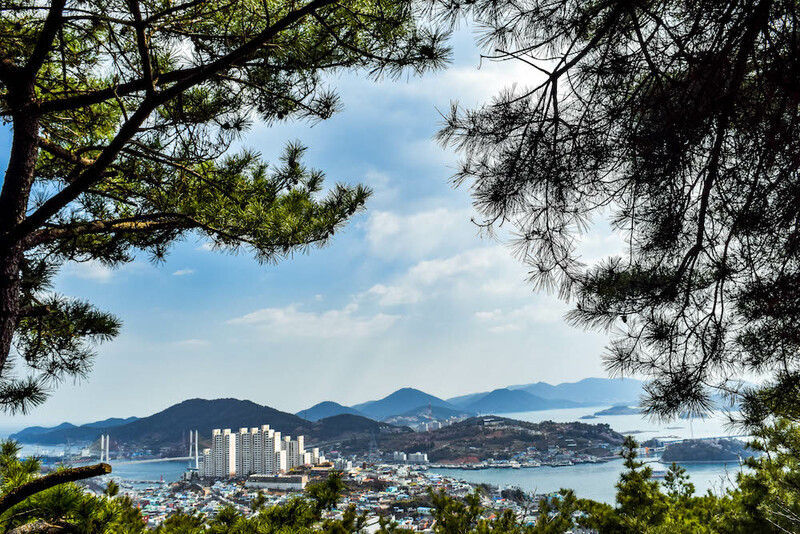 Where to stay in Yeosu: Suzy Pension. Jeff with our friend Lee in traditional Korean clothing. Jeonju is a popular destination in South Korea, mostly among Korean travellers. There is a lot of gorgeous architecture and you can try out a lot of local Korean food. 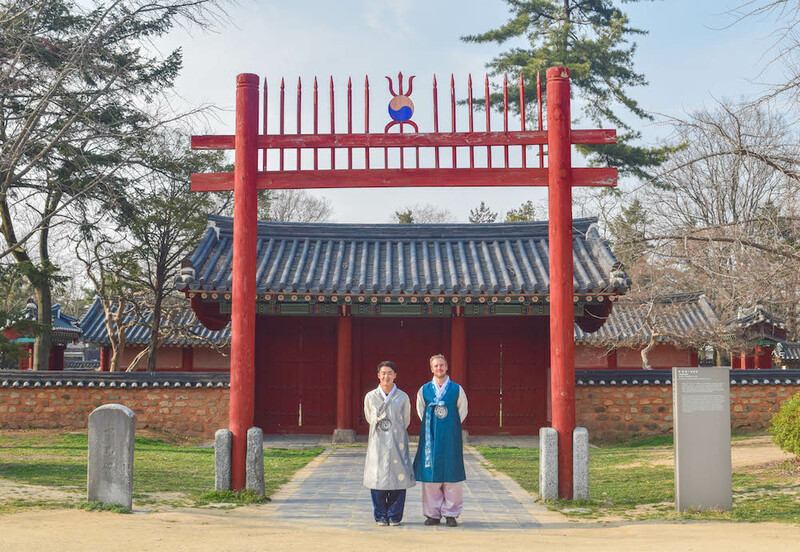 One of the reasons we wanted to visit Jeonju was to try on Korean traditional clothing… Another reason was the fact that there is a hanok village! So, go to Jeonju to explore the hundreds of hanok houses. The traditional homes of the Korean upper class. You can even spent the night in one of the hanok houses, as many are used as a guesthouse. We don’t have a post on Jeonju yet. But I will write one real soon. Where to stay in Jeonju: Hanok Village Gguldanji. It’s a bit weird to visit the border of North Korea. At the moment I was there, it was so crystal clear to me how lucky I am just to be born in a free country. This place in Korea is not a beautiful place, but it’s definitely interesting. It’s a very educational experience and it can really open your eyes to the conditions of the North Korean people. 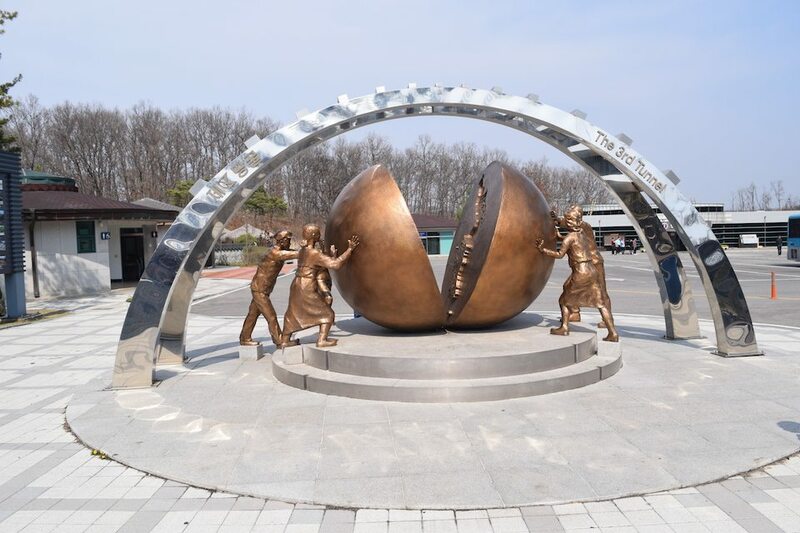 If you want to visit the border of North Korea, you have to go with a tour. We went with the Panjumjom Travel Center Tour. You can read our review about our visit in our article A visit to the DMZ with a North Korean Defector. During a tour to the DMZ, you can even set foot in North Korea and have a glimpse of North Korean soldiers. These were 6 beautiful and interesting places to visit in Korea. Of course there is a lot more to explore in this fascinating country. We definitely want to return in the future! Have you ever been to South Korea? What was your favourite destination? Never been to Korea but it has long been on my bucket list! Love your article. Thanks for putting this list together. My image of South Korea is kimchi and shopping – neither of which I’m too keen on – so it’s great to know there’s a lot more to do and see! Great Suggestions! South Korea is on my travel bucket list!